New arrivals have been coming thick and fast at Apache, with a series of cracking Autumn Winter 2018 garments gracing our shelves. 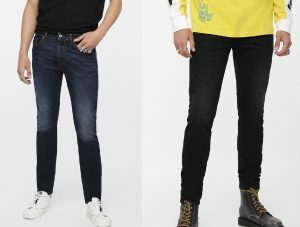 As the seasons change, so do outfits, and many of our customers are now thinking about combining jeans with a sweatshirt due to the cooler autumn weather. Our Italian denim by Diesel and Replay is of the highest quality, and we’re delighted to unveil a handful of stunning new washes for Autumn Winter 2018. Use the offer code AUTUMN18 to claim 10% off all new menswear! 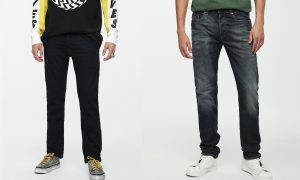 The Thommer slim-skinny jean has already built up a big following among our loyal Diesel-heads. The skinny fit will make legs appear a little longer and slimmer than a regular tapered jean, but without being too tight against the skin. 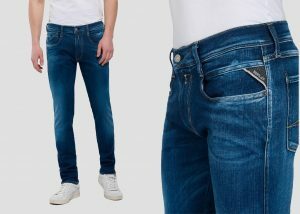 Not only that, but a generous shape around the thighs makes a great jean for sporty lads who cycle or work out at the gym. Two new washes for AW18, Dark Blue and Black, make the Thommer as good an investment as ever. Like all of our Diesel jeans the fabric includes a hint of stretch. Get the Thommer jean now in your perfect size in Short and Regular lengths, also available in one inch size drops from 30 waist to 36 waist. Hyperflex jeans by Replay are that rare thing in fashion — a breakthrough in technology that remains true to classic design principles while remaining affordable to the average punter. The super-stretchy fabric allows you to sit in virtually any position without losing it’s shape, making it great for cyclists, or indeed anyone who wants to enjoy superior comfort. This brand new Surf Blue wash for Autumn Winter 2018 goes well with our range of sweatshirts and knitwear. Hyperflex jeans come in one length, and also in between sizes including 31 and 33 waist. Diesel’s Belther and Buster fits are probably our best selling jeans, offering a comfy regular tapered fit ideal for all body shapes. Both fits come in brand new washes for Autumn Winter 2018. The Belther jean has a gorgeously super-soft finish, reminding us almost of satin and a guarantee of comfort. The Buster boasts a stunning mid vintage wash that is quite unlike anything in our shop. Available in Short, Regular and Long lengths, these magnificent jeans come in sizes ranging from 30 to 38 waist. You’ll need a great sweatshirt to go with those jeans — that’s where Farah come in. Their vintage collection delivers top quality styles year in, year out, and Autumn Winter 2018 is no different. Check out these quarter-zip sweatshirts in three marl colours — True Navy, Black and Light Grey. Made from soft 100% loopback cotton, these sweatshirts come into their own when layered over a T-shirt. Available from Small to Extra Large. Lyle & Scott are one of our longest running vintage brands. Famed for their British heritage fashion, they specialise in bringing out exciting new colours for existing garments. 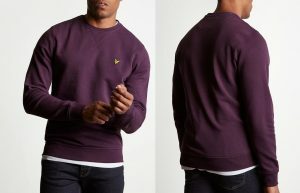 We love this Deep Plum version of the classic Crew Neck Sweatshirt, also available in 3 older colours. 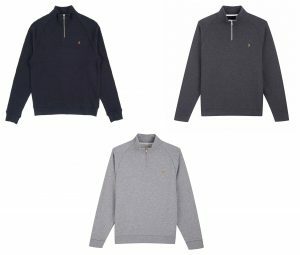 The loopback 100% cotton interior is a mark of quality, making it lighter and more breathable, suitable for wearing all year round. Hopefully you’ve now got a few ideas for a classic autumn outfit. Use the offer code AUTUMN18 to claim 10% off everything in this blog.